Gorgeous summer nights call for a gorgeous summer beverage! 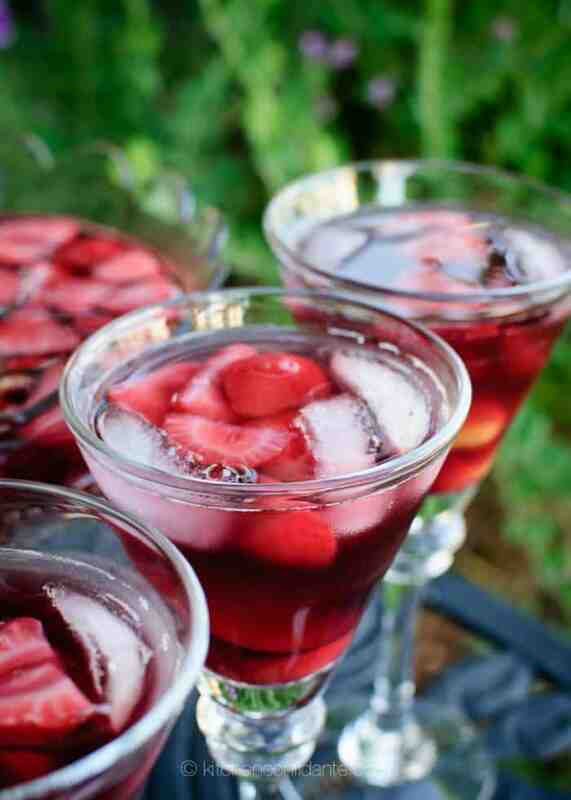 Enjoy this Summer Sangria with Rum at your next barbecue or pool party! Summer Sangria with Rum is perfectly refreshing on a warm summer night thanks to the combination of wine and rum with summer fruits and lime soda. This sangria is easy to make so you can keep relaxing with your guests at your next barbecue or brunch. Enjoy this recipe all summer long! Shall I pour you something refreshing to jump start your weekend? How does a Sangria sound to you? Spiked with rum? Here you go: Summer Sangria with Rum. Remember, the fruit is the best part. Last Friday, we gathered with our neighbors. It was a gorgeous summer night, which called for a gorgeous summer beverage. Sangria is a wine punch originating from Spain and Portugal, where, it should be noted, the brilliant concept of siesta is still practiced. Ah, sometimes I wonder if I’m living in the right place. They seem to understand the proper way to live on the old continent. Sangria has many variations, but the overall gist is the same. You start with a wine. Red or white, that’s up to you. And here is where a more economical bottle of wine is quite welcome. You spike it with some liquor, such as brandy, triple sec, or in my case, rum. Sweeten it. And then you let your favorite fruits soak in all the loveliness. 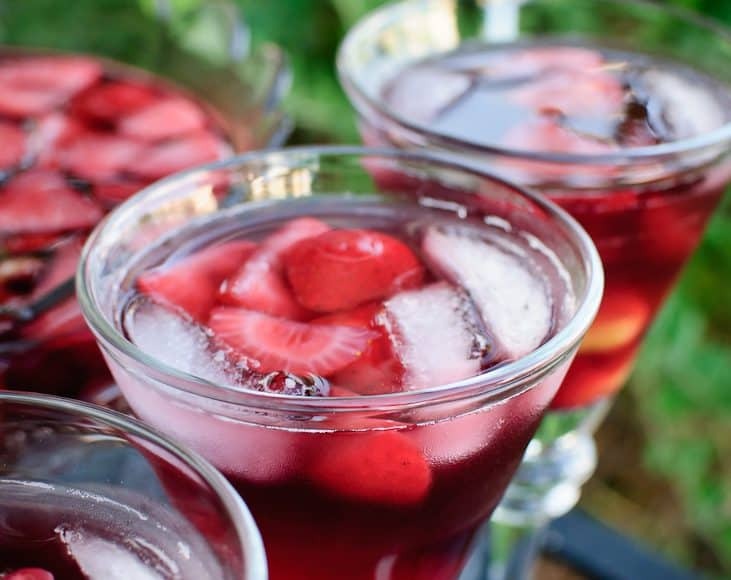 Breathe in the gorgeous aromas of the fruit in the sangria – it’s almost as intoxicating as drinking it. I used some of my favorite summer fruits in this Summer Sangria with Rum: gorgeous plums, strawberries, and Rainier cherries. Swirling in pinot noir and rum, the drinks were a sultry red, but the flavors were lightened by simple syrup and lime soda. Perfectly refreshing. Utterly relaxing. Maybe even better than a siesta. Summer Sangria with Rum is perfectly refreshing on a warm summer night thanks to the combination of wine and rum with summer fruits and lime soda. This sangria is easy to make so you can keep relaxing with your guests at your next barbecue or brunch. Enjoy all summer long! In a pitcher or glass bowl, combine wine, rum, and fruit. Gently muddle the fruit into the alcohol by pressing and stirring with a large spoon. Stir in the simple syrup (and mint if desired), cover tightly with plastic wrap and refrigerate until chilled, at least 1-2 hours. Before serving, stir in the lime soda. Serve over ice if you wish. Cheers! Combine water and sugar in a saucepan and bring to a boil over medium-high heat. Reduce heat to low and simmer until sugar dissolves, about 3-4 minutes. Cool completely. With your sweet treats, I would want to be your neighbor too, Kate! It is extremely excruciating to look at these beautiful photos of fun summer alcoholic drinks when you’re knocked-up. lol Here’s to NEXT summer! Oh no! I have been in your shoes, so I really feel terribly for torturing you! Wish I could make a non-alcoholic sangria for you. Something to look forward to when the baby baking is all done! This may have to be on the menu this weekend. Yum! Your sangria looks so amazing and refreshing! I love your fruit choice too. I was fortunate enough to spend a couple weeks in Spain recently and I completely agree — they definitely know how to live. These photos transport me to a little spot in Barcelona where we slowly sipped sangria … the entire afternoon. Heaven. Oh this sounds good! Love Sangria – but the rum is a great spicy twist! Love to enjoy a Sangria right now. Great summer time drink. You photographed them beautifuly. I’m a huge sangria fan and enjoy it on a regular basis. A favorite summer drink here. It’s a little taste of Andalusia each time. Thanks for sharing, Liren! Quite simply, Sangria sounds GLORIOUS right now. It is so hot! Thank you for sharing another inspired drink. I hope you have a great weekend, my friend. I’m looking forward to relaxing and baking! Much love from Austin. This is fabulous! I would love to have a tall glass of this right now! Buzzed! Wow! What an amazing looking summer sangria! I am always on the hunt for the perfect sangria recipe, and I am dying to try this one! Just found your blog, and I am absolutely LOVING it! How beautifully presented. I also wish I lived near you. A summer evening with friends and something sophisticated to sip is how life was meant to be. What a GREAT way to spend a summer evening with great neighbors! Your sangria looks simply divine! Have a wonderful weekend!!! I’ve never had sangria… and as I look at these beautiful photographs I have got to ask myself why not? Guess I just have to whip up a batch to try! Ah, summer in a glass ; ) Beautiful Liren! This is what summer is all about…good company, beautiful evenings, delicious food and enough drink to stay merry. This sangria sounds & looks so good. It would probably knock me off my feet before I knew it, but I’d enjoy it just the same and want more. Delicious use of Pinot with all the fresh summer fruits – lovely post, Liren! Hi! Can I use “red” rum in place of the light rum ingredient? Would it taste right, as red rum has a carribean taste? Thank you so much!! Wow! I can get a buzz almost from such gorgeous photography, even without a sip of the sangria. Thanks for making the world a more beautiful place.